Goodreads Summary: Welcome to the most magical house in London. The family of eleven-year-old twins Oz and Lily have inherited it, together with the mysterious shop downstairs. Long ago, the shop’s famous chocolate-makers, who also happen to be Oz and Lily’s great uncles, were clever sorcerers. Now evil villians are hunting for the secret of their greatest recipe. The terrifying powers of this magic chocolate have the ability to destroy the world. Soon, Oz and Lily are swept into a thrilling battle, helped by an invisible cat, a talking rat, and the ghost of an elephant. It’s up to them to stop the villians and keep the magical chocolate recipe out of harm’s way. Their family and the world depends on it. I loved this book, but I have to warn you. 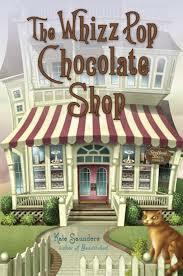 The title might make you think this a sweet story about a candy shop. Not so. It’s got murder (yea, I know a tad disconcerting for an elementary age level book but there are no violent details) magic, international intrigue, a rather lovable villain, talking animals (including an immortal, invisible body glitter wearing cat) and dyslexia. Saunders magically weaves it all together to make an engaging, easy read. A villain is redeemed, a young girl discovers hidden courage and the knowledge that she is more than her dyslexia and of course the world is saved – all by 11 year old children. What child wouldn’t love this book? It would be an excellent choice for a classroom read aloud. I checked this book out from the public library because I thought it might be a good title for my Mock Newbery club in the fall. Though the writing is certainly good enough for the Newbery (IMHO), it isn’t eligible since Saunders is not an American author. However, I know my students will love this book and I’ve already ordered two copies for the library.